Gift cards - whether you want to treat your teacher to an evening out or just a cup of coffee, gift cards are always appreciated because the recipient can use them for something that they were going to purchase anyway, or treat themselves to something fun. A pampering session - treat your teacher to a massage or a manicure. It's something that any teacher would appreciate and it means a lot that you gave the gift of relaxation! 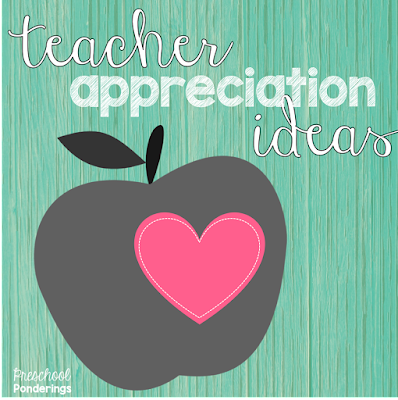 Supplies for the classroom - whether you pick out some fun post-it notes or collect a ton of school supplies so that your teacher doesn't have to buy them for next year's students, the sentiment means that you know how much your teacher gives to his or her students. Flowers - There's something about flowers that makes people smile. A bouquet that your teacher can leave on her desk will brighten up the classroom and your teacher's day. A heartfelt note - We don't often take the time to tell others that we appreciate their hard work. A few minutes spent writing a personal note will mean more to any teacher than something that you bought at the store. While you're at it, help your child write a note too! These are all gifts that I received from students and their families, a gift doesn't have to be extravagant to be meaningful, and your teacher will be touched that you took the time to thank them for all of different things that they've done this year.